Who are the real comic heroes? Yesterday on iO9, young James W got the shock of his life from a realistic Popeye figurine, a 3D toy cast somewhere between Frank Miller’s Marv and Robin William’s turn in the Altman movie. 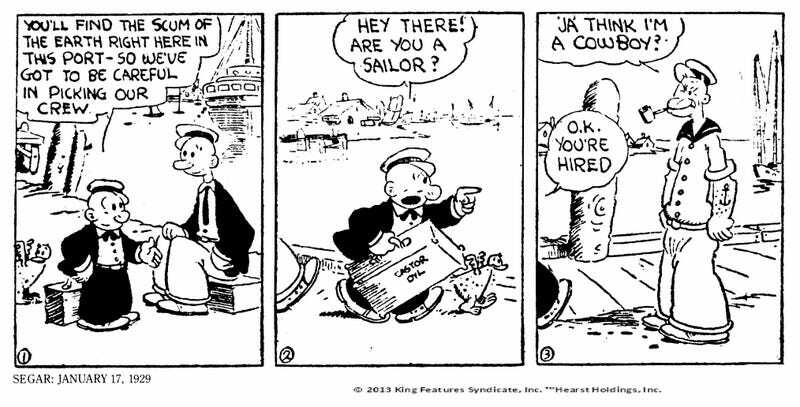 I found this slightly funny because Popeye is said to have been inspired by Frank ‘Rocky’ Fiegel, a real life resident in Elzie Segar’s home town of Chester, Illinois. Segar apparently used to send him money (if not spinach) and there are tales of Fiegel giving would-be robbers a thrashing they didn’t expect. And today news broke that The Beano has sent a “cease-and-desist” letter to arch-Tory Jacob Rees-Mogg over his resemblance to Dennis the Menace’s foe, Walter the Softy. They seem to have forgotten that he sometimes carries off as a top-hatted clone of Lord Snooty. But it got me thinking, Marvel Comics’ Unstable Molecules brings a Beat Age sensibility to the origin of the Fantastic Four with the conceit that Reed and co were real people. Of course, some will argue with authority that Reed and Ben are both facets of Jack Kirby’s inner being. So who are the real people behind the comics, or any other fantasy character for that matter? Locally, our own King Bran, one of those people who stands between legend and historical event, had a reputation for transforming into crows. I have no idea if it was the three-eyed variety. Some will say that Troy Tempest of Stingray fame was modeled on James Garner who had been blazing a trail in Maverick. That gets smudged a bit sometimes but the Tracy Brothers in Thunderbirds are affirmatively confirmed as being named after pioneering American astronauts. 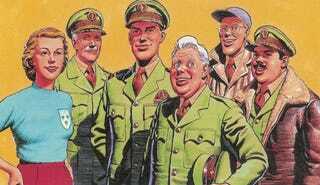 While he predicted Rian Hughes’ jaw and Brexit decades before, The Eagle’s Dan Dare made regular use of studio members and family to pose for scenes. Notably Sir Hubert Guest is the spitting image of Frank Hampson’s father and the original Professor Peabody was artist Greta Tomlinson. During the time Doctor Who was off air there was a lot of chatter with fantasy casting that saw Julia Sawalha and Emma Thompson in the spotlight as potential sidekicks for a revived Time Lord. Julia was eventually cursed with a fatal death in the Moffat Manifesto, while Thompson escaped to Hollywood. Except, a character description for Virgin Books New Adventures novels lifts a scene from The Tall Guy. With that in mind I’ve always read Bennie Summerfield as Nurse Lemon if not Thompson herself. But there is a caveat to add, because I have read that comic artist and storyboarder Lee Sullivam used his wife as a model for visualisations of Bennie. So can you think of any comic characters or fantasy figures with a real life counterpart?